There was never that one moment. As a kid I played hockey in the winter and rode a bike in the summer. I was combining those two disciplines until I turned 14 and realized that cycling and being outside is much more fun. Every time I win a race and can raise my hands in the air is special. Ronde van Vlaanderen and Paris-Roubaix. These are legendary races in which you have to be 100% ready. I also like cobbles, especially when my form is at its peak. I always wanted to be a professional rider, so I can’t imagine myself doing something else. Josef Černý is the 2018 Czech national champion in both the road race and individual time trial. 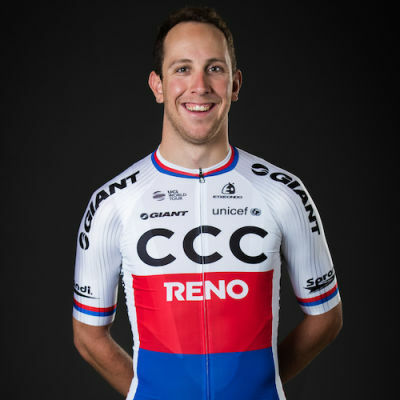 He jumped onto the professional scene in 2013 as a rider of a CCC-sponsored team and did it in style by finishing 2nd in a stage at Giro del Trentino and wearing the leader’s jersey for one day. Černý proved his potential later on, winning the general classification at the Czech Cycling Tour and Okolo Jižních Čech. In addition to winning two national titles, his 2018 season was marked with multiple top-5 finishes in stage races.